Third Eye Blind is the debut studio album by American rock band Third Eye Blind, released on April 8, 1997. The album spawned five singles, including the top ten chart hits "Semi-Charmed Life", "Jumper", and "How's It Going to Be". While Third Eye Blind only peaked at #25 on the Billboard 200, it spent 106 weeks on the chart. Three singles from the album charted in the top 10 of the Billboard Hot 100: "Semi-Charmed Life", "Jumper", and "How's It Going to Be". It is the group's best-selling album, having been certified 6× Platinum by the RIAA. There are variations of the cover art. The first US issue of Third Eye Blind, approximately 500,000 copies, featured a gold-tinted cover photograph by photographer Christine Alicino, with a dark red band logo. The colors were then reverted (as seen above). UK and other Continental European nations continued offering the gold edition, and Japan had a cyan, negative photo cover. The 20th Anniversary Edition of the album features a black version of the cover. All tracks written by Stephan Jenkins and Kevin Cadogan, except where noted. ^ Erlewine, Stephen Thomas. "Third Eye Blind – Third Eye Blind". AllMusic. Retrieved December 1, 2015. ^ Christgau, Robert (2000). 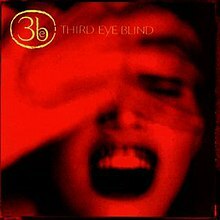 "Third Eye Blind: Third Eye Blind". Christgau's Consumer Guide: Albums of the '90s. St. Martin's Press. ISBN 0-312-24560-2. Retrieved December 1, 2015. ^ Larkin, Colin (2009). "Third Eye Blind". The Encyclopedia of Popular Music (4th ed.). Oxford University Press. ISBN 0-199-72636-1. Retrieved March 5, 2017. ^ Grad, David (April 25, 1997). "Third Eye Blind". Entertainment Weekly. Retrieved December 1, 2015. ^ Moon, Tom (2004). "Third Eye Blind". In Brackett, Nathan; Hoard, Christian. The New Rolling Stone Album Guide (4th ed.). Simon & Schuster. p. 810. ISBN 0-7432-0169-8. ^ a b Trust, Gary, Alex Vitoulis, et al. "Reba McEntire Nets Second No. 1 On Billboard 200". billboard.biz. August 28, 2009. ^ "Gold and Platinum Database Search". Retrieved 2009-06-18. ^ "Third Eye Blind". Andrew-Turnbull.net. Retrieved on 12-12-08. ^ "Third Eye Blind - Self-Titled - 20th Anniversary Edition -IN STOCK - Third Eye Blind". 3eb.com. Retrieved on 10-29-17. This page was last edited on 16 April 2019, at 16:22 (UTC).